The author, from what I've read, is mostly a comic writer. There tends to be hints of humor in Daredevil runs, even just one-liners, no matter how somber the storylines get, so picking a writer who excels at humor makes sense for Daredevil. This is all somber. 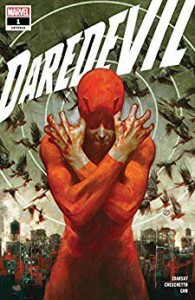 I'd say it makes sense: the last ongoing series left Daredevil at a low point, physically battered for years - with no hospital visits, may I add, at least for the most part. I won't spoil specifically what happens, but an incident leaves him dealing with that ongoing physical trauma, possibly dead, then hey, maybe unable to walk. He has to painstakingly build himself up again. So I was pretty shocked at how humorless this was. That isn't to say it bad; my star rating proves that I loved this. I'm still hoping this gets funny at some point; Zdarsky does funny so well that I consider him mostly a comic writer. (A writer of comedy as opposed to a writer of comics. It's pretty unfair: he does other things quite well, his strong point to me is just comedy.) Shocked - and pleased. This put Matt through the wringer, but I'm hoping things get better for him, and it was just flat out well done, a pleasure to read after the new Man Without Fear mini-series.